It includes an 8 ounce bottle of the newest product in the NN Bath & Body line, Hand & Body Wash, made from a liquid soap paste I recently learned how to do. Diluted down enough , but not too much, a touch of Orange Essential oil added and it’s Body Wash! it can also work nicely as a hand wash or even a shampoo! Smells sooooo nice. I use the same scent in some for my own hair and love it! The bathroom smells amazing every time I take a shower! lol! There’s an 8 ounce bottle of Hand & Body lotion, made with aloe juice, and shea butter, nice, thick, rich, not sticky and lightly fragrance with a floral EO blend. Really a nice lotion any time, but with the addition of the aloe, it’s great for help in healing scrapes, scratches, and sunburn, too. There’s a four ounce tub, though the contents don’t add up to four ounces in weight because it’s whipped body butter. The scent is a nice soothing chamomile, made with cocoa & shea butters and a specialty Chamomile butter. A tiny touch of chamomile fragrance is added in for a little bit of aromatherapy after a long hard day working in the yard, garden, etc. There are three butters in all plus 1 oil, grapeseed, in the body butter, then it’s whipped several times to give it a lightness of being that’s absolutely out of this world for sinking in where it’s needed most…deep in your skin. 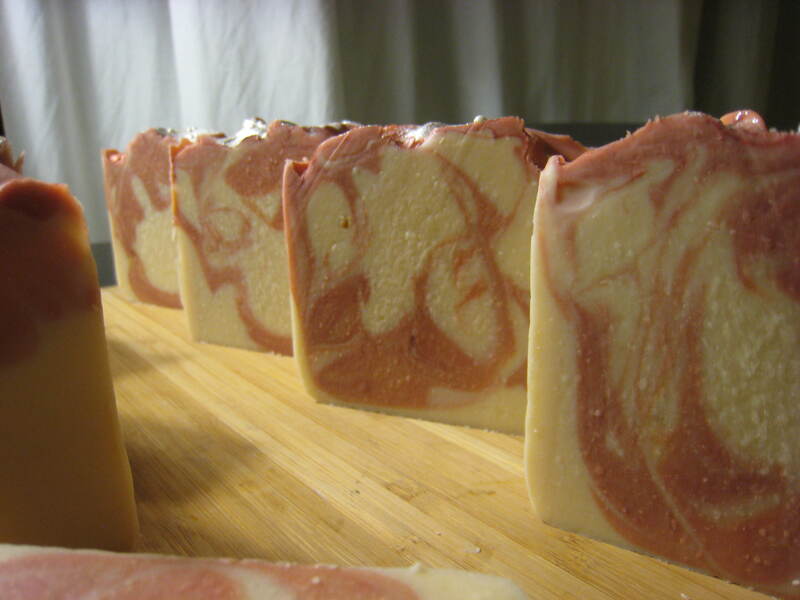 There’s also a healthy selection of soaps – 6 bars in all. They are Cucumber-Mint, Ripe Raspberry, Just Peachy!, Passionfruit-Nectarine, Gardener’s & Cooks, Garden of Delight. 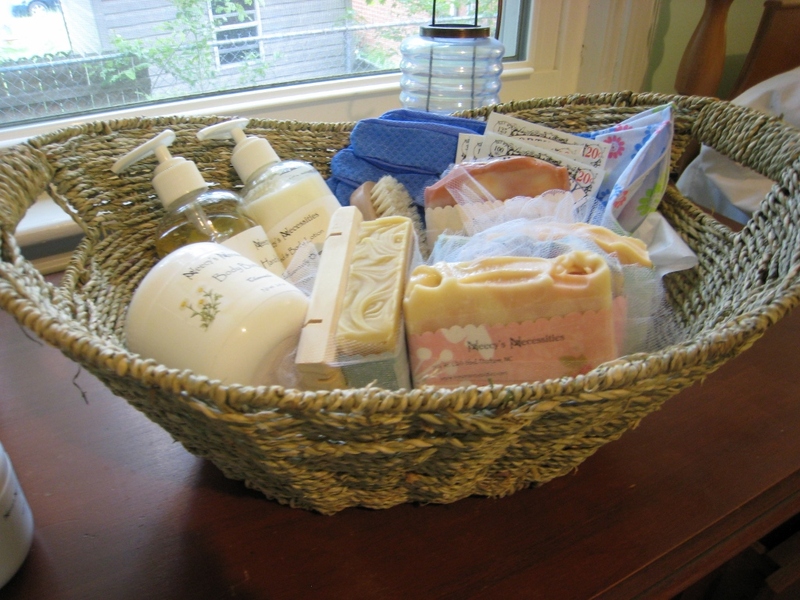 Thought those particular scents would be appropriate for a gardening themed goodie basket…. These are all full-sized bars, too, so the recipient will certainly be well-stocked when they get this prize. At least for a few months, anyway. Several business cards will also be tucked discreetly amongst the goodies, along with a nice wooden soap dish, and a wooden nail scrubber that I bought from some lovely soapers in Facebook in the group Vendor Stuff for Sale. That is one handy group to belong to, I have to say. Cost a bit for the past month, but I’m set for a while now and at half or less the original cost had I ordered it from the actual online vendor. I even lucked out on finding waterproof labels! Squee! After doign this for the scond year, I’m hopeful that this will get my web site noticed a bit more than it has. It’s had some pretty sad stats for the first year, but I’m not giving up just yet. I get good reviews from people who’ve used my soaps, and I’m suing here at home too, so I know what it has and needs work on. William’s a terrific amount of help there, too, particularly with colors, scents, and marketing ideas. But I need to keep working on getting my name out there to more people. I know the products ae good. Others need to find this out, too now. Here’s the cut view of BRV, sunning itself outside on a beautiful 80° Spring day in North Carolina. Pollen was everywhere so we didn’t linger. The New Moon Mica swirl shimmers in the sunshine very nicely . It’s a shame though that the sugar pearls developed a bit of a ‘halo’ effect around them from the soap coming in contact with them. I didn’t let this get at all, but chilled it in the fridge for several hours, then let it rest overnight and cut it this afternoon. It’s a perfect afternoon for a photo shoot, too, with the bright blue skies, the birds singing all around, the sounds of people cutting their grass, which then sends that wonderful summertime scent out into the air for everyone to enjoy. I love the smell of clipped grass. It reminds me of watermelon – green, wet, & summery. These will be ready for shipment May 6th, so they’d make a perfectly-timed, yummy Mother’s Day gift. I also hope to have them ready to go out for the next Tantalizing Sampler for June/July. I hope. We’ll see. In the meantime, get out there and make it a great day, everybody! So many other soapers have used this fragrance in their soaps, using widely varying techniques to swirl it that it intrigued me to try it out, if only just to find out what it smells like soaped CP style. It didn’t accelerate At. All. 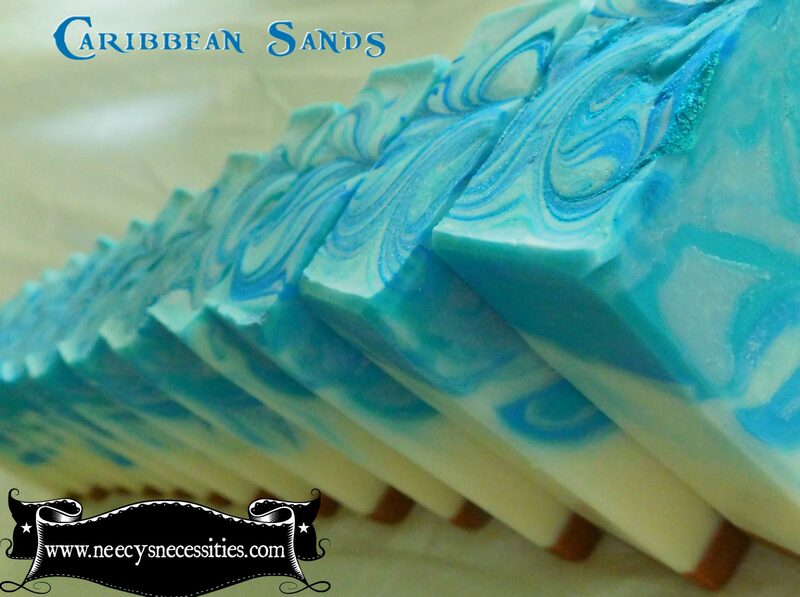 Fabulous fragrance to soap with if you ever decide to try it out. The data sheet stated no vanilla content, so I didn’t need to add a stabilizer and it worked out perfectly without it. This particular version of BRV is from Wholesale Supplies Plus, but I’ve heard that Bramble Berry also has a wonderful version as well. Someday I’ll get some and find out. A fragrance distributor within a particular Facebook group also sells a version, so it’ll be interesting to compare the results from each over time. This batch was rather small since I have so much stock setting on the cure racks already, but it’s enough to use a log mold and use two different swirls designs. The colours were from Conservatorie – Peacock Blue and Shimmering Red Clay micas blended together to give (hopefully) a dark plum shade. Guess I’ll find out soon enough if blended , though allegedly CP friendly micas morph. It’s a hanger swirl beneath the surface. 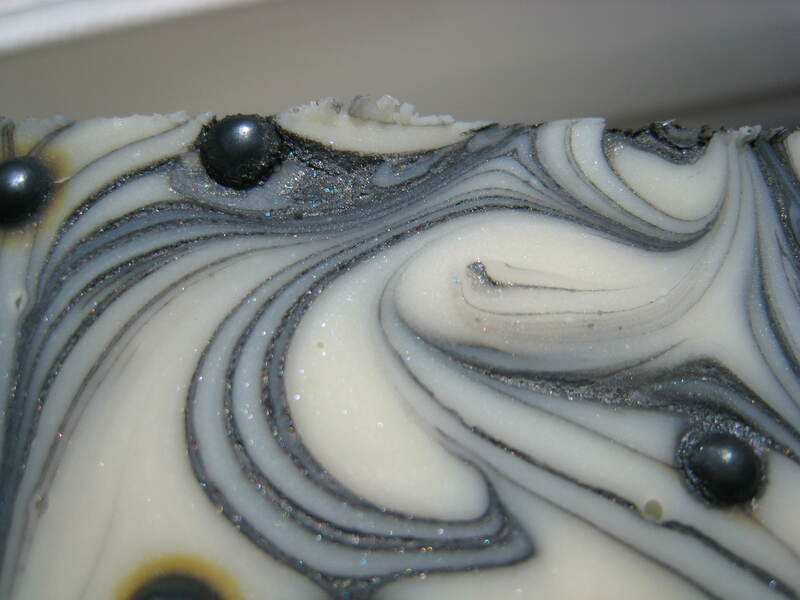 I used a bit of New Moon Black Mica for a mica-in- oil swirl on the top, dotted with sugar pearls in black. I also added some White Pearl Mica to the contrasting colour beneath the surface. I’m keeping my fingers crossed that this time, the hanger was wide enough to make a visibly obvious swirl in the two coloured soap. The last one was a bit of a disappointment due to the hanger being a bit too narrow. It has silk, and a bit of superfatting with cocoa butter as well, so with luck, this one will be not only pretty but also feel wonderful on the skin when used. I love this fragrance! It’s lush without being overpowering or sickly sweet. It isn’t going to ever take the place of the Peach Jubilee from WSP in CP soap, but it’s a good one to keep as a mainstay. That peach, omg, is such a full bodied scent. In cp soap it smells like peaches & cream, I kid you not. Mmmm, makes my mouth water and my eyes roll whenever I smell it in the room when the air stirs from the fans. So, here’s the pic of the BRV in the mold while it was still wet, newly poured and swirled with a wooden skewer. 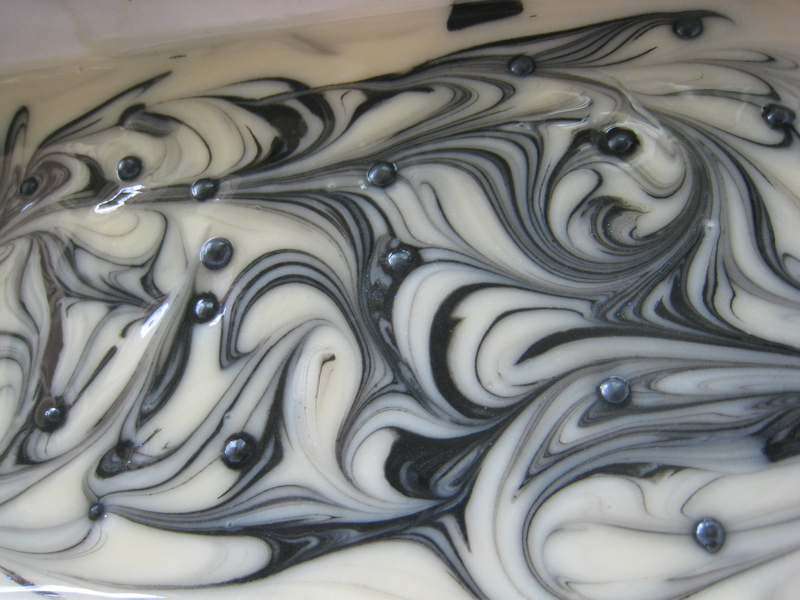 Black Raspberry Vanilla Silky Milk Soap. 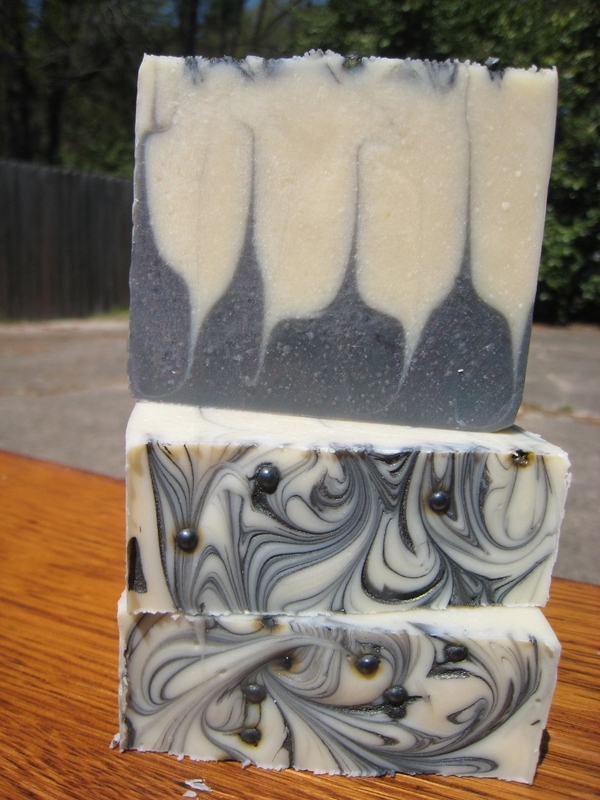 A coconut milk soap – ready May 6th, just in time for Mother’s Day! I’m only using the Abalone part of this FO’s name for the soap since the colours reflect that part of the name more than the Sea part. The colours were from Conservatorie once again and this time I added in a mica ribbon on the top and lots of dips, peaks and swirls for mica to sparkle in the light. The colours were the Peacock Blue and 1 from Bramble Berry called Hydrated Chrome Green. The iridescent glitter was from NG. There were a few minor changes to the basic recipe such as adding in cocoa & shea butters to the original olive, almond and coconut oils, along with the coconut milk, colloidal oatmeal, goats milk, buttermilk, Tussah silk, Vitamin E, and using aloe juice with the lye instead of plain old water. 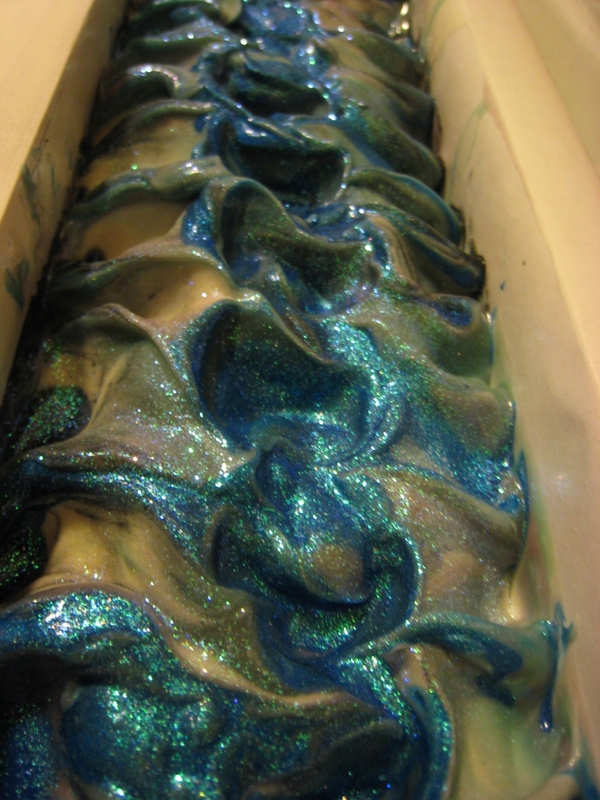 There was a black ribbon embedded within the soap, along with portions of the soap being coloured with the green, the blue, and a bit of violet, too. With the clear contrast between the white portions alongside those vivid colours, it really swirl exactly the way it should. It didn’t hurt that the FO didn’t cause any acceleration or ricing. What a relief! The swirls turned out beautifully and it really pops on the tops colour-wise due to the mica ribbon that was swirled into the top during the texturizing. That was about the only ‘first’ here. The FO was purchased from a fellow soaper who was doing a bit of spring cleaning, so it didn’t cost nearly as much to buy it from her as it would have from the original supplier. I actually bought several from her and hop to get to them all eventually, but one batch at a time is best, and this was the one I wanted to try most of all along with another called Abalone & Sea. For three days I sniffed a tester strip (index card cut into strips then dipped quickly into an FO), noting the levels that came out over time. The Abalone & Sea became more like the floral high end perfume type of scent, while the Passionfruit Nectarine became more like a peach, at least to me. I’ve soaped both but for this post I’ll focus on the Passionfruit Nectarine. The recipe had coconut water mixed with the lye with silk fibres added to dissolved during the heating of the lye. If anyone else tries using coconut water, be warned that it will turn orange when it begins to interact. This can be overcome by adding in some titanium dioxide. I still used coconut milk, but wanted to try using coconut water this time since it’s so rich in vitamins and minerals, and even if it doesn’t lend anything to the soap that can be felt, it will impart something beneficial quietly through the skin to maybe combat the effects of sun-damaged skin, chemical damage from air pollutants, etc. That’s the hope anyway. We all could use a few extra anti-oxidants, don’t you think? No one has ever been rushed to the hospital from an antioxidant overdose so far as I know. The usual oils were used along with the addition of castor and palm oils to imbue moisturizing qualities in the final soap even after cure is done. All went pretty smoothly and the FO soaps very nicely. No discoloration, though I did add a bit of the vanilla colour stabilizer as the FO labels states it has a 0.20% vanilla content. Just to be on the safe side. If it discoloured it might not do much of it, but I don’t want to risk it and waste the use of the micas used. I started out with the thought/hope/dream of doing an elemental swirl, but the colours were too close together in shade, so it doesn’t really show up all that well. Note to self: use highly contrasting or complementary colours when attempting elemental swirls! This fragrance did not discolour, accelerate or rice, so it’s really a wonderful scent to CP soap with and is perfect for those who don’t like floral fragrances. There are a few out there, one being a steady customer of mine, so there is a demand for soaps that are not floral heavy. PS: this pic was taken prior to smoothing, beveling and evening up was done.